The Latino Cultural Center (LCC) is part of a broad community of support. Explore the menu to the left or the Latino Resource Guide below, which offer a wide variety of campus and community resources to assist you with your academic and professional growth. "We want to welcome you to the University of Illinois at Chicago. 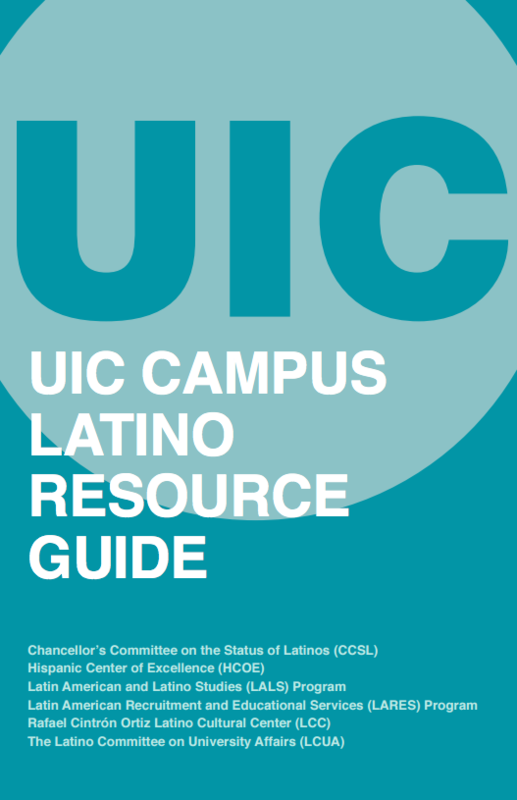 We are delighted to share with you our first Campus Latino Resource Guide. UIC has a rich tradition of academic success, cultura, and community. We created this resource guide to help you navigate the various Latinx* resources on campus and the myriad of services and opportunities available for Latinx students. It is our hope that this guide will provide you with the tools you need to grow academically, socially, and professionally as an integral member of the university community." In addition to the great resources listed in this guide, the L@s GANAS program is also important to note. It was not yet launched when the guide was written, but serves a key role on campus today supporting Latinx students in STEM fields.